Diamante Dunes Course Hole 1: There aren't many trees on the Dunes golf course, but there are few to bother the golfer from the elevated first tee. Nonetheless, the fairway is pretty wide with the pot bunker being the thing to avoid most. 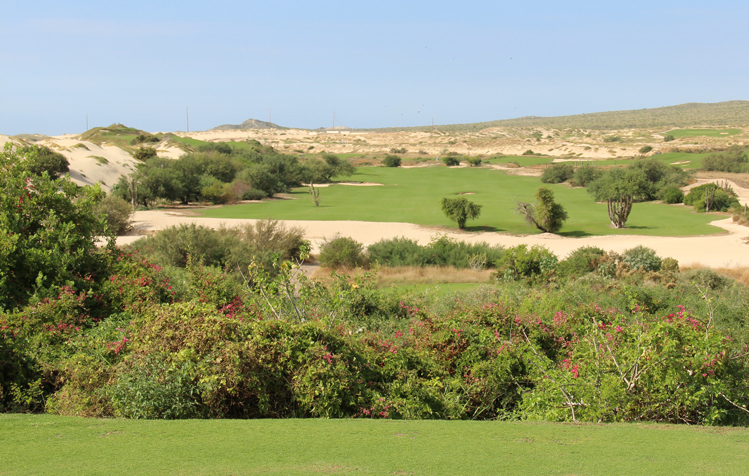 The green is then set left towards the large sand dunes, but played as a three shot hole, it's a fairly docile opener with a good chance to score. Diamante Dunes Course Hole 2: This is a wholly unique and outstanding par three. The tee shot is played with the massive sand dune behind the green, which is at least 200 yards away from most tee boxes. The green is wide and has a tier that drops the right third of the green down a bit from the rest to make it partially blind. Diamante Dunes Course Hole 4: This short par four has another great view of the humongous dunes that the course gets its name from. It can be driven by a large strike but there is, of course, danger involved in the form of the dune as well as a large bunker by the left of the green. The normal shot will stay left of the junk that cuts across the middle of the landing area. From there, the shot will be uphill with that bunker in front. 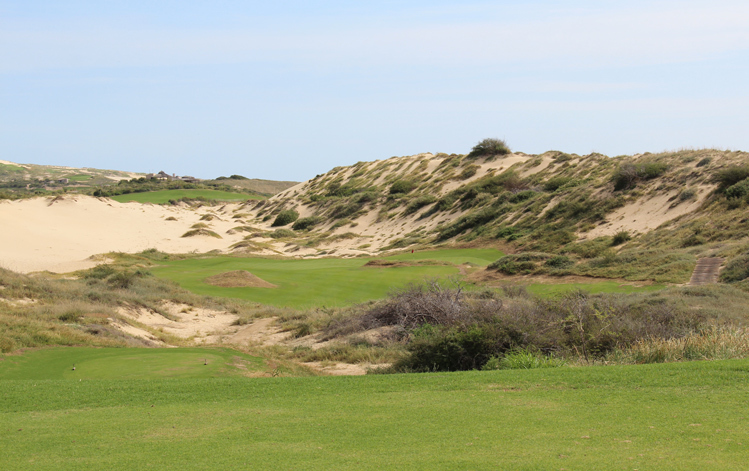 Diamante Dunes Course Hole 5: A par three with an ocean view, the feature here is a wide green with deep bunkers short that have to be avoided to keep the score below bogey most of the time. 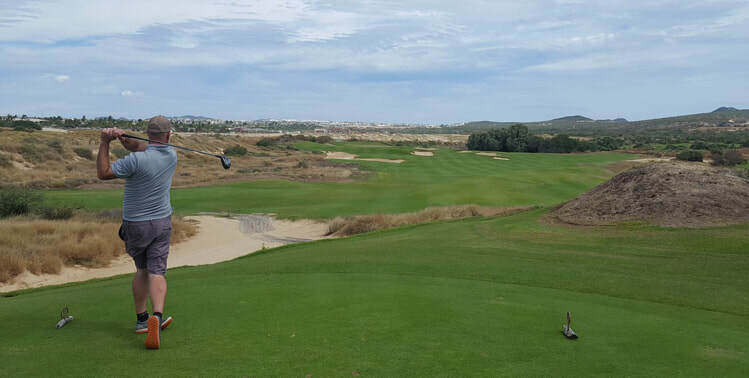 Diamante Dunes Course Hole 6: This is the best scoring opportunity on the front as, even from the back tees, it's a par five less than 500 yards. There is nothing but trouble, however, down the left and right sides of the hole, and the green is cut in a bowl, surrounded by dunes. So, accurate shots will reward great scores here, but wayward shots can lead to a much larger than expected number on the card. 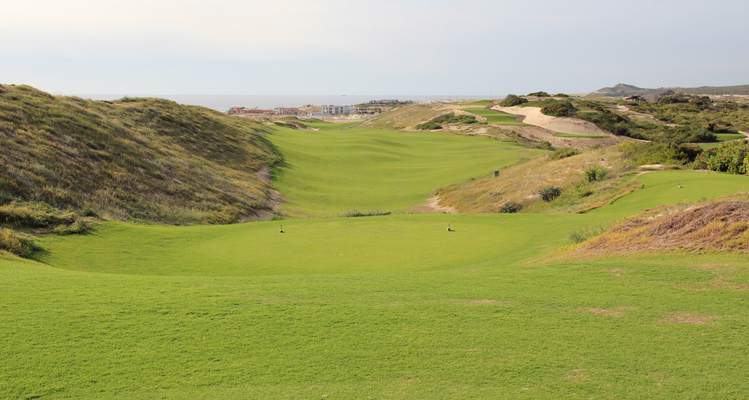 Diamante Dunes Course Hole 7: This downhill par three is very long (290 yards from the back tees). There isn't a ton of trouble to deal with but the length is enough. Shots that come up short will likely roll down the hill away from the sloping green, which is very wide and heavily sloped from back to front. Diamante Dunes Course Hole 8 Arguably the widest landing area on the property as well as the easiest par, this hole still is visually well set up and the obvious mistake is to put the drive in any of the bunkers. The green's undulations provide the holes best defense with portions that break in a myriad of directions. 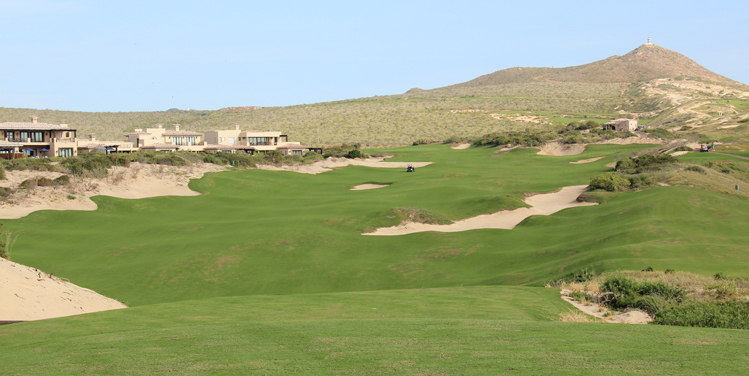 Diamante Dunes Course Hole 9: The closing hole to the front is a long, slight dogleg right par four with a forest of El Cardonal cactus to the right side. The green is uphill across the desert wash, with a massive false front, and has lots of undulation. Shots that go a little long will likely come back down onto the surface. Diamante Dunes Course Hole 10: When the original 18th hole succumbed to its ideal location for more real estate, the itty bitty par three 10th came into being. Not long or difficult, the pot bunkers short-left and middle right provide the obvious and only real trouble, but the player can play safely away from them to a very deep green that is tough to putt from any significant difference as the front and back portions are raised above the middle section. 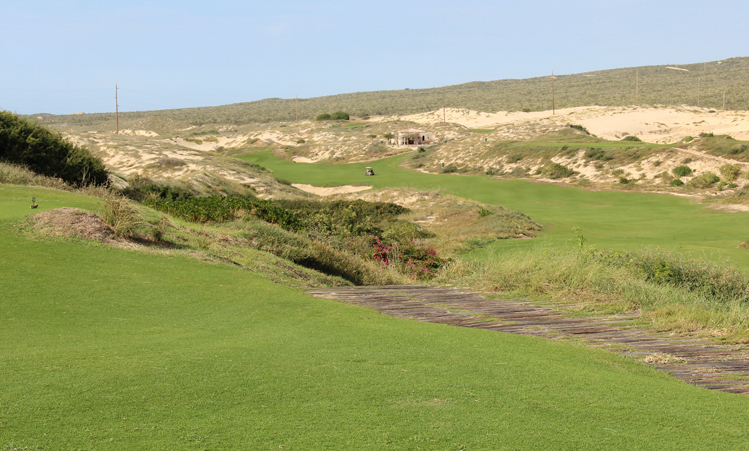 Diamante Dunes Course Hole 11: This hole is almost cruel as it currently a par four that is close to 500 yards. Although the tee shot is downhill a little, the second shot goes back uphill so it will take all of the golfer's gusto to reach this green in regulation. The hole is pretty wide, but the greenside bunker is deep and tough. Diamante Dunes Course Hole 13: Part of the redesign that got rid of the two holes wrapping around a lake in favor of two holes that stay more consistent with the rest of the course, this one is a fun par five that seems to be cut out of the side of one of the larges dunes. Going right or left is bad on the first two shots, but the green complex changes this rule as the penalties for missing left are severe, whereas right misses may actually find the green. Sadly, of late, there is construction of a hotel left of the hole, which has hampered the once amazing dune scape view, but the hole itself is still largely the same and strong in its own right. 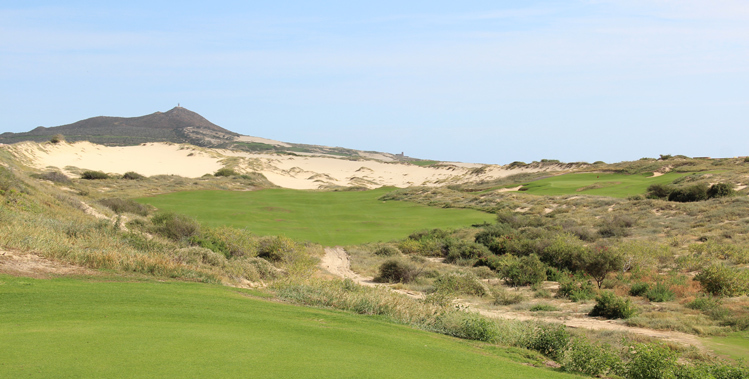 Diamante Dunes Course Hole 15: This par five is long and very natural feeling. Without a bunker on the first shot, the golfer can give it a rip and see what happens. The second then plays up towards a massive bunker that has to be missed to leave a good shot into the relatively small and tough green. 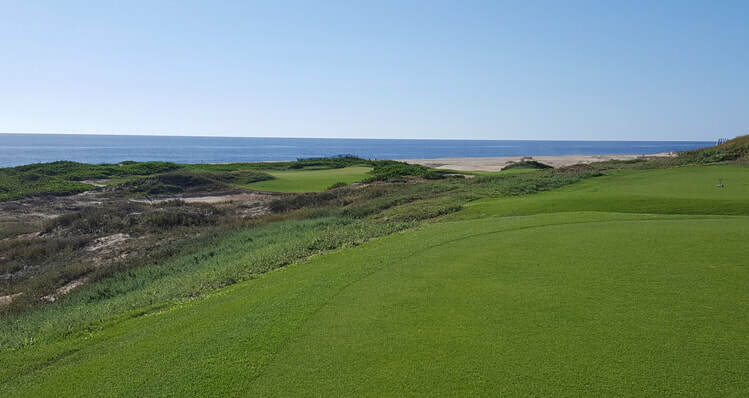 Diamante Dunes Course Hole 16: This is a classic beach-side par four that simply doglegs left around the sand traps and surrounding natural sands to a nice little green perched near the Pacific with great views. 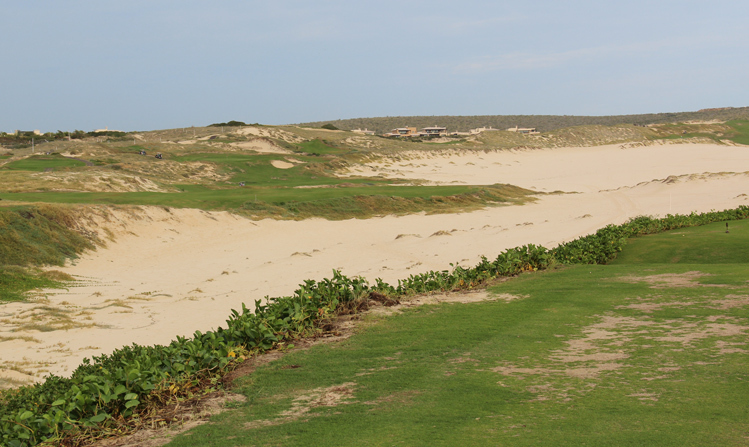 Diamante Dunes Course Hole 17: This short par three is just about the nice location down by the beach. There is a green with lots of nooks and crannies that really should be hit from any tee box. Diamante Dunes Course Hole 18: This par five plays away from the ocean and gives the player a great view of the scale of the beach/dunes. The landing areas is wide with a huge drive being able to catch a down slope to gain more yards. However, reaching the green in two is a nasty proposition as the green is way uphill and will reject shots short in bunkers or worse. 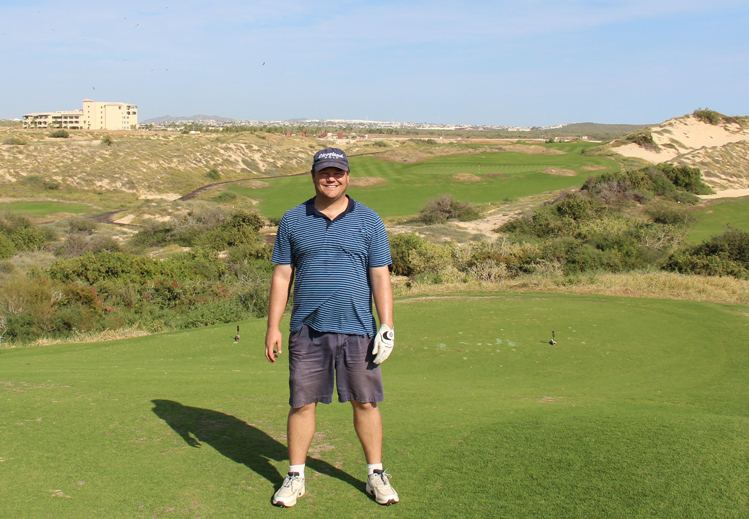 Played as a three shot hole, the second is fairly docile and can leave a short iron uphill to the wide, sloping green. Similar to the 13th, the hotel sits now to the right of the hole, which makes the view not as spectacular but along with an added, massive central bunker, OB right has made the tee shot more challenging. Breaking Eighty does a great job reviewing Diamante Dunes as well.